CANTERBURY Times readers over the past two years have been familiar with monthly contributions to the Way We Were page submitted by David Lewis, web coordinator for the CHAS (Canterbury Historical and Archaeological Society). Most of his articles have bean based on material drawn from the notebook history section of the CHAS website. The site has now won an important local literary award, the John and Peggy Hayes Canterbury Award. The award commemorates John Hayes, who was head of history at Canterbury Christ Church University until his death in 1980, and his wife Peggy, who died in 2011. It is presented to the author of the best piece of work about Canterbury published during the previous year. 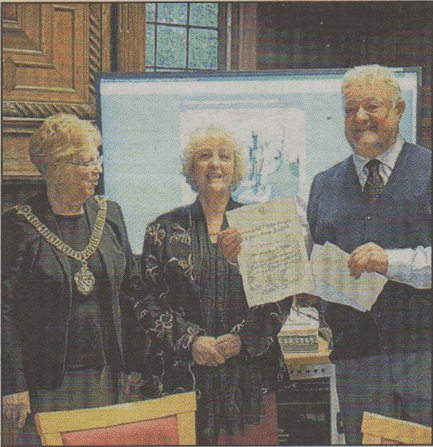 Pauline Waiters (CHAS chairperson) and David Lewis accepted the award from Canterbury Lord Mayor, Ann Taylor, at a ceremony held last week (Tuesday, December 2) at St Martin’s Priory. The Priory now forms part of the Canterbury Christ Church University, and the event was organised by Jackie Eales, Professor of Early Modern History at Canterbury Christ Church University. In receiving the award, David emphasised that the website was the result of a concerted effort by a team of several individuals. Some of these, including Steve Rogers, Alan Thistleton, Jeremy Dunhill, and Sue Chambers were present at the award ceremony. He pointed out that the site www.canterbury-archaeology.org.uk now includes nearly 400 pages and over 1600 colour images. It covers a wide range of historical topics including the cathedral, churches, almshouses, railways, mills, gates, etc. In the street furniture section (much of which is not available in other sources) there is more on the city ironwork, boundary stones, GPO markers, paving stones, post boxes and telephone kiosks. The biograpNcal sections cover over 90 Individuals who have featured in the history of the city. Recent extensions have included research notes. oral history, and outlines of recent relevant publications. Users can also find details of source literature (supplemented with a bibliography of the city), indexes, site word search, a clickable city map, and internal hyperlinks for easy cross-referencing, on average, more than 500 users now consult the site every day. The award will be used to extend the site to cover more on the city architecture. Anyone who feels they could contribute to this work is invited to get in touch via the CHAS website.